This monograph of the artist Guy Van Bossche is a selection from the impressive oeuvre of works of art wich he has realized since the ... . In our time, charecterized and marked by multiculturalism and post-modernism, society is searching increasingly for inspiration and challenge in the past. And not uncommonly, that is where it is hidden. The individual, however, in search of specific personal sensitivities, partially follows the same path. Someone like Guy Van Bossche does not hide that, althought he does attempt to escape from it. In the past, painters would take a vase of flowers and paint that. Or they went outside and painted the clouds, the trees, the sea. Or they had a model sit on the sofa and tried to reproduce body and soul on canvas. Gust De Smet went to the fair, Permeke to the farmers. Nowadays many painters are more likely to look for provocation or theme in painting itself. No wonder we find with Guy Van Bossche references to René Magritte, R. B. Kitaj, David Hockney, Richard Hamilton and orthers. I do want not to give specific examples, list titles of works or art or make comparisons. That could not only make me stray into the anecdotal or an art history lesson, it is unnecessary for anyone who has a knowledge or art history ant it can be hindance - by working in too generalizing a way - to allowing others to look and enjoy open-mindedly. But it is worthwhile that I point this out so taht the onlooker who is not well-grounded in this fiels of (picture-related) knowledge also realizes that only the greatest artists in their field shift the boundaries of the past and anchor the future in the present. One way or another, the artist - thus, also Guy Van Bossche - is stuck between two stools, one could say. To counteract that, however, he adds something, in the one work more than the other, to his references: he opens up the image plane and introduces carefully chosen and often purely abstracting element, as if he refines the idea selected from art history and makes it his own. With Magritte it is the image itself which is fundamental, with Van Bossche it is the image plane, the area within which the story is told. 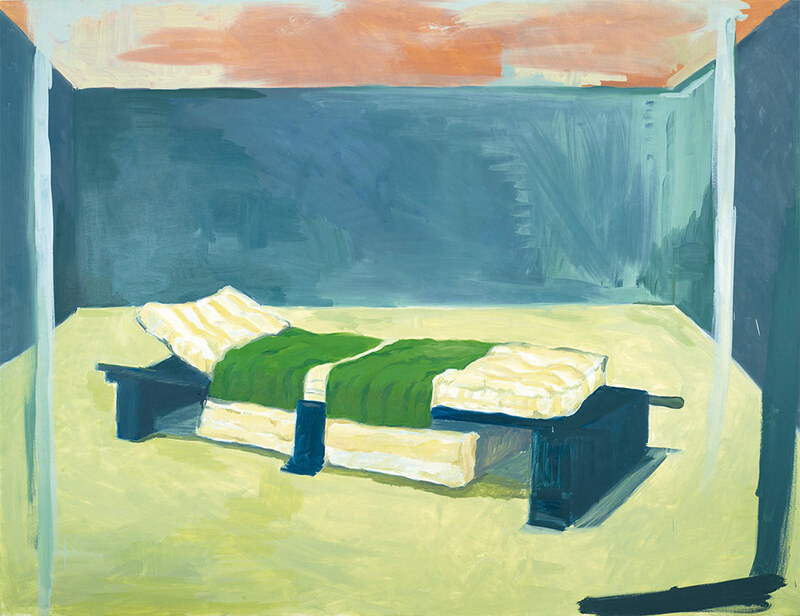 But despite the finding that the painter builds up a subtle tension between the story and the area within the image plane, the result is nevertheless never clear and the allure is often and explicity injected through the sensual note her strikes - and whereby he smartly and skilfully exudes the pictorial atmosphere of a Raoul De Keyser. In other words, the painter starts from the art of painting and adds, in a sensitive merging of light and dark, iconic elements from that same art to his work. But through the restlessness he creates betwen the spatial and the desgin, through the alienating, not seldom confusing and intriguing composition of the story, he aims to escape from his source - from the artists who have opened his eyes and shown him the way. Via that escape manoeuvre he becomes himself: Guy Van Bossche.